Peter Clark Takes A Historical Look At The Nearly 40-Year-Old History Of The North Shore Aero Club. David Clews Finds A Remarkable Collection Of Aircraft At Istanbul's Turkish Aviation Museum. The Editor Tags Along With The Flying Doctor. 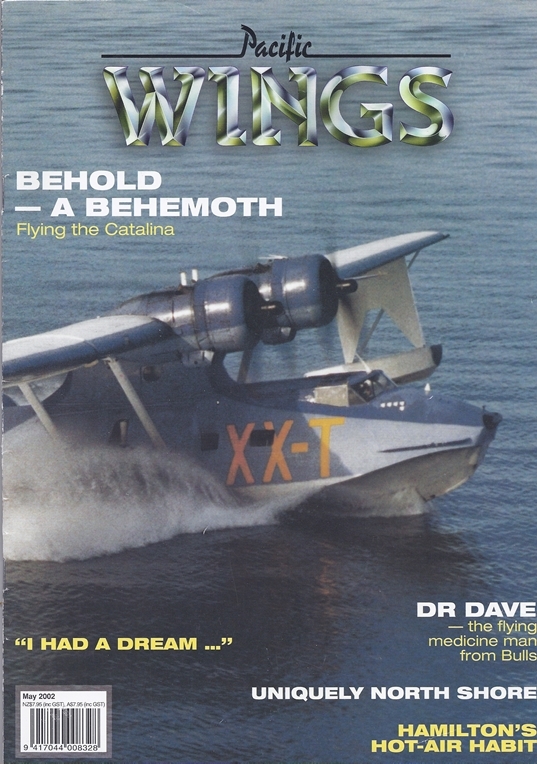 One Of New Zealand's Catalina Amphibian Flying Boat Pilots, Ben Sinnock, Describes In His Own, Unique Way, What It's Like To Fly This Unusual, Rare And Historic Aircraft. Colin Zuppicich Reports On The Recent Balloons Over Waikato. Pacific Wings Has Been Given A Pre-Publication Preview Of Ross Ewing's Forthcoming Book On The A-4's 30-Plus Of Service With The RNZAF. Ruth Presland Describes The New Zealand Arrival And Launching Of Her Very Own Aircraft From Tis Factory In Italy. It's Big And It's Yellow, New Cresco's, And The Agricola's Departure. Steve Clark Introduces A New Column Looking At The Growing World Of Virutal Flight.